Are you sitting too much at work? Probably. In fact, if you work in an office the odds are good that you spend most of your day sitting at your desk and hunched over your computer. This isn’t good for your health. In fact, it’s downright dangerous. A recent story on Slate by writer Jason Bittel spells out the dangers. According to Bittel’s story, our bodies aren’t designed to sit for 11 hours. And that’s what many of us are doing. Even when we’re not at work, we’re sitting in our cars or slouching on our coaches watching TV. The solution seems obvious: We need to move around more. Of course, exercise – along with a nutritional diet – has always been an important part of living a happy, healthy life. The key, as Bittel writes, is to force yourself away from that computer for short walking breaks. And when you are sitting in front of your computer, try not to slouch. Bittel includes a call at the end of his story for participants in a quick Google Hangout every half hour. The Hangout meeting is designed to get people away from their computers and on their feet. 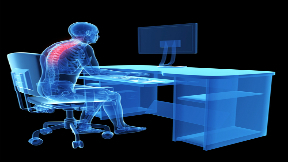 You can also build an ergonomic workstation to keep yourself from slouching and sitting the day away. CNET writer Sharon Vaknin provides tips on this. The first step is to find your ideal natural posture. For many people, Vaknin writes, this posture is the same one you use while driving a car: Your feet are on the floor in front of you. Your hands are in your lap. And your shoulders relax as you lean back slightly. Memorize this posture, and use it whenever you sit at your desk. Next, you need to position your keyboard and mouse in the right place. These devices should be positioned so that your elbows are at your sides and your arms are at or below a 90–degree angle, Vaknin writes. Your keyboard should also be located at a height about 1 to 2 inches above your thighs. This might require you purchase a pull–out keyboard tray.